Last fall I appeared on the morning television show Showcase Minnesota to help promote the fifth annual Alpaca Farm Tour hosted by Alpacas of Minnesota. On this show my handmade felted alpaca journals appeared briefly but were not left unnoticed. I have received requests for the instructions on how to make these handmade felted journals. I ment to get this tutorial put together sooner but real life got in the way. It took a simple request from my online twitter friend @AlpacaFarmGirl to get my behind in gear and get pictures taken and the tutorial compiled. Click here to download this FREE tutorial to start creating your handmade felted journals today! I hope you enjoy my Fiber Arts Friday Blog Carnival Entry! Thanks so much KJ for sharing this with us at Fiber Arts Friday! This is an awesome project, and you are a creative diva! Just found you through Alpaca Farmgirl. Really like your innovation in finding yet another awesome way to use alpaca fiber. Way to go! I really love this project. 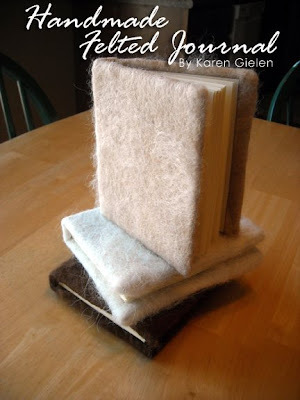 I have an alpaca with nice, but short fleece and I think it would be perfect for the felted journal cover. I also appreciate your instructions - they're very clear and the pictures are great. I've never needle felted before but feel confident that I could make the journal cover. Good luck with shearing next week! Very interesting to see how these are made! The finished product is beautiful.